Use the Leather Repair Kit to fix rips, tears, burns, holes and other damages in leather. Comes with all the right products and tools to make professional repairs to all leather items. Bought individually this kit would cost over HK$377. The leather repair kit is a small kit containing all the products required to quickly and easily make professional repairs to an damaged leather item, regardless of your level of experience or technical abilities. Repair cuts, holes, tears, rips and all other surface damage yourself, at a fraction of the cost of purchasing a new item or calling out a professional. This kit only contains the products needed to repair the damage and not colour it. If you want to make a small repair invisible use our Touch Up Kit, or for larger repairs, use our Leather Colourant Kit. This will allow you to match the colour of your leather and apply the colourant to the repair for a seamless and professional finish. The leather on this MR2 has been very badly worn on the side, a large hole has developed and the leather is very badly scuffed. The leather has been repaired using the Leather Repair Kit for the damage and then re-coloured using the small Leather Colourant Kit. 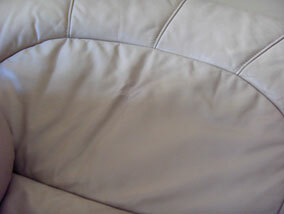 The top of this sofa has had a very large split in it. Something which is easier to repair than it looks! 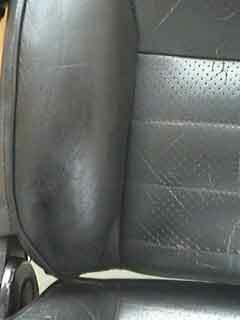 The damage was repaired using a basic leather repair kit and then the colour was replaced using a Leather Colourant Kit. 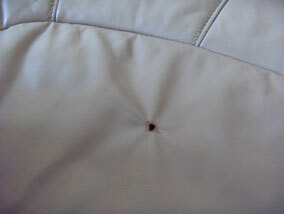 This leather sofa suffered a cigarette burn that disfigured the leather and burned a hole through it. 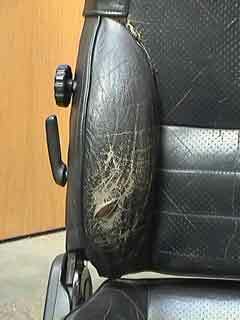 This is a common problem, but can be easily repaired with the products provided in the kit. The leather has been repaired using the Leather Repair Kit for the damage and then re-coloured using the small Leather Colourant Kit. This kit is excellent value for money - if all products were purchased individually, they would total over £30. The products provided in the leather care kit are sufficient for the repair of several small areas of damage, or around 4-5 small rips or cigarette burns for example, for larger areas of damage the coverage will be reduced as would be expected. In terms of shelf life, the kit will last for many years if kept in a cool, dry area with the lids fastened. Recently purchased a leather repair kit from you for my BMW and it worked very well indeed! Just followed the excellent instructions for a flawless finish.